Chef Rangi Mitaera-Johnson: what motivated you to become chef and what challenges did you face in your career? What do you like the most today in your work? Cooking has been a passion of mine for many years but I thought that it would take too long to complete. Actually, it has been an amazing journey that introduced me to my husband and our own little agri-accommodation we ran on our isolated Island called Manihiki. Being so isolated, I had to be innovative & include adaptation mechanism to our whole business structure. The challenges of living on a coral atoll sometimes meant that everyday ingredients were not readily available. We began curing our farmed pigs, raising our own chickens for eggs & planting our own vegetables. We have a 12 bedroom home with 6 bathrooms so immediately were asked accommodate the telecommunication company staff traveling to our island. People already knew my background as a chef and working in the industry for many years. So we were sort of pushed into this area. As time progressed, we realised that there was a lot of food around us that was not being utilized. We had to find a way to include them into our menu options. I was already baking bread and selling it in our store. So the challenges I faced have now become a whole range of endless opportunities. Could you tell us what cuisine and food you promote and offer in your restaurant and how you connect with the local farming community? Currently, I work as a freelance chef where I am called upon to cater for private and corporate functions. All my menus are based on local seasonal produce which I source from local markets, farmers and fishers. Most of my seafood is sourced by my husband who is a capable fisherman. As pearl farmers, I have utilised pearl meat as a core ingredient on my menu. My work with Robert Oliver features seafood and pearl meat in both his book Me'a Kai and the Cook Islands TV series of Real Pasifika. My pearl meat dish made notoriety in France with a full length picture which hung on the Arc de Triomphe during the Cook Book of the year celebrations. I work with a few government agencies to promote Healthy living and food programmes. 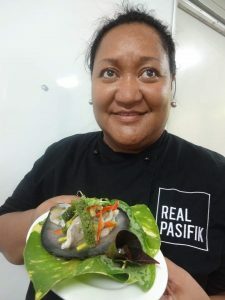 I am currently collaborating with Tourism Cook Islands Corporation to develop local foods in the food industry. It also incorporates local, cultural and traditional knowledge as a key part of developing this programme alongside an innovative appreciation of where our foods can be taken to at a higher level. This has been so exciting for us and something we look forward to next month. I network with my village, family, social and professional groups to source, secure and encourage a good business relationship. A common understanding of each other's needs, limitations and expectations must be met. You run a small resort in Cook Islands. Do you have many tourists? What experiences do you offer to them and what do they like the most in traditional food? Most of our visitors have been locals who come to our island to carry out work, so they are usually government workers. Before all our guests arrive, I always ask for any dietary restriction. Most our our people don't have any, but there are always those with religious restrictions. Most people who have dietary restrictions are usually foreigners. On our Island we don't offer a menu to select from, but every meal is different. A full breakfast with homemade bacon and sausages, eggs and homemade bread, muffins or pancakes always feature with drinking coconuts and fruits in season. Lunch usually is delivered to place of work which may include fresh salads, raw fish, fruit and drinks. Dinner will feature local seafood dishes, local salads, barbequed local meat & fish. Food on our island is very different from food sourced on the mainland. We have an extensive range of seafood available both inshore and pelagic varieties. As a freelance chef on the mainland, my knowledge of local ingredients sets me apart from other chefs. I am able to source and create dishes not normally available to the general public. I like to revamp traditional ingredients in my menu options. How do you see the development of your business and what are the most pressing needs? I love the creative nature of cooking and developing new recipes and stunning guests with innovative appreciation of traditional local foods. It's a continuous journey that is not static, more ideas abound. What we need today is for our people to want to learn and to appreciate their food as an important part of their identity which is so worthy which should always be their first choice. You attended recently an agritourism workshop in Fiji where various countries exchanged their experience. 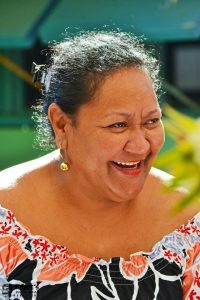 What did you learned that can be useful in your business in Cook islands? That Agritourism can be developed utilising land that we inherit from our forefathers which costs nothing. That it doesn't necessarily have to be 36 acres in size, but could incorporate farmed property of several people in your village. That planting local crops is valuable that can sustain both your business and family needs, but a diverse strategic plan is encouraged. That sometimes we don't have to travel too far to ask for help. Sometimes if we can't find answers on island, help can be found in the region. That sometimes when we think we are not doing so well, sometimes we just need to review, upgrade and repacked what we have into something a little different.